I’ve made so many of these baby blankets that I’m not sure there’s anything left to say. They’re cute, they’re quick to make, and sometimes they even become the little recipient’s must-have blanket. The pink bear I made back in 2011 became just such a blanket. 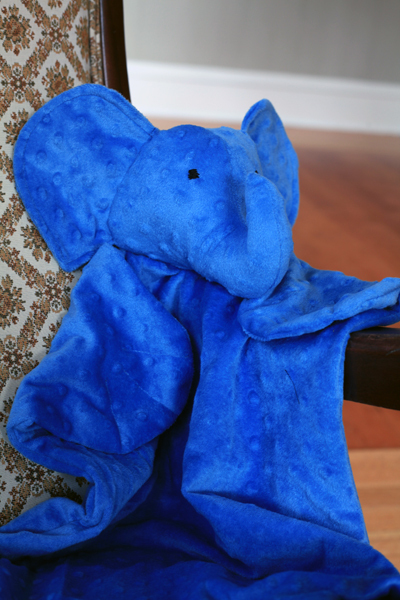 Maybe this cute blue elephant will fill the same role for my friend’s future son… Or maybe not? Either way, I can’t help but pull out the minky every single time I get a baby shower invitation in the mail – just in case. I love when you make these. They’re just so cute! Oh, these are so cute! I’m happy to see there’s a cat one. There are so many babies popping up in my life lately, and I’ve been looking for a good baby shower gift that is cat themed! Wow. These are so adorable! Makes me think – I need to make a baby.